The earliest castle dates back to the XI century, but first mention of a Lord of Bois Thibault dates from 1195 with Hubert de Logé. 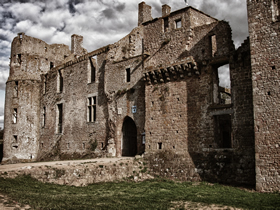 The castle remained in this family for a hundred years (1492) when the eldest daughter of Jehan de Logé married Jehan III du Bellay; she was just twelve years old at the time and she brought the estate of Bois Thibault to the Du Bellays on marriage. The castle remained the property of the du Bellay family until 1751. This is the very same du Bellay family which boasted the poet Joachim du BellayIn 1762 it was sold in auction to Léonor-François de Tournely, who carried out a lot of restoration work. In 1925 it passed to the de Broglie family and thereafter to Mr and Mme Soubrier, a Parisian antique dealer, who sadly left it to rack and ruin. In 1988 it was bought by the commune of Lassay-les-Châteaux.Thanks to the "Association Culturelle" and previously the "Association Bois Thibault Past & Future", voluntary work each year at the site helps restoration work by cleaning, repairing and consolidating the remaining edifice.The Bois Thibault Castle is to be found about a kilometre from town on the Domfront / Sept Forges road. Between May and September, you can visit the château Bois Thibault on Saturdays and Sundays from 14h00 until 17h30; you will be offered a free guided tour in English or French !